In <i>The Clock Repairer's Manual,</i> Mick Watters explains how to approach all aspects of clock repair, maintenance, and cleaning with confidence. 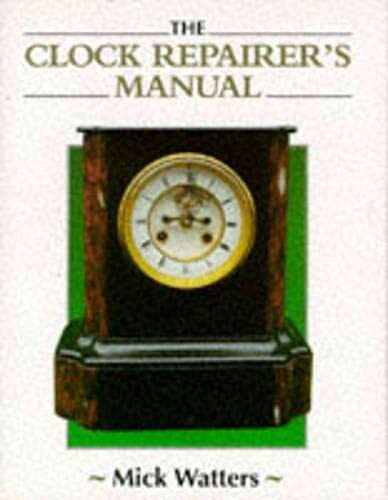 For anyone who has ever considered clock repair as a hobby or a profession, as well as those under initial training and for the existing repairer, this comprehensively illustrated and detailed manual will be a useful reference. Topics covered include the typical clock movement; dismantling, cleaning, and reassembling; striking and chiming clocks; repairing worn pivots and bushing; and escapements, staff fitting, and jewelling. Fahrenheit's Books is an open shop in Denver, Colorado, please feel free to visit us if you are in the neighborhood, we are open every day except Monday. We have an eclectic general stock of approximately 40,000 titles. Fahrenheit's Books is a member of the Rocky Mountain Antiquarian Booksellers Association (RMABA), and was picked by 5280 Magazine as the editor's choice for Top Used Bookstore in Denver, and by Westword Magazine as "Denver's Best Literary Survivor on the Move". Please visit our website at www.fahrenheitsbooks.com. Online titles are stored in a separate facility, so if you would like to see any of these titles at the shop, please email us and we will bring them down for you. We accept Visa, Mastercard, Discover, & money orders (for U.S. dollars only drawn on U.S. banks only please), and cash (at your own risk of course).